The record is made up of 1 map sheet. It was created in 1937?. It was written in English. The original is part of the British Library: India Office The department of the British Government to which the Government of India reported between 1858 and 1947. The successor to the Court of Directors. Records and Private Papers. 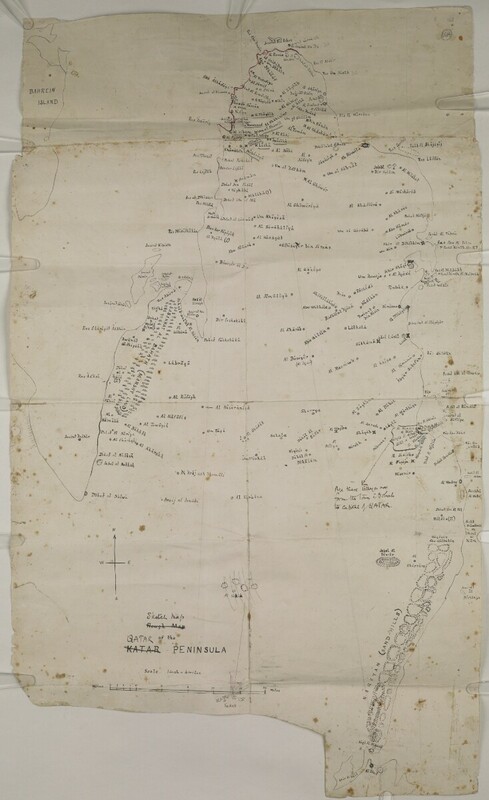 Title corrected to: ‘Sketch map of the QATAR PENINSULA’. Coast between Zubara and Jabel al Tabena outlined in red. Numerous additions and corrections to place names and topographical features. ‘Al Doha’ underlined in blue crayon and ‘DOHAH’ added in later hand with coordinates inserted in pencil and annotation: ‘All these villages now form the town of Dohah the capital of QATAR’.